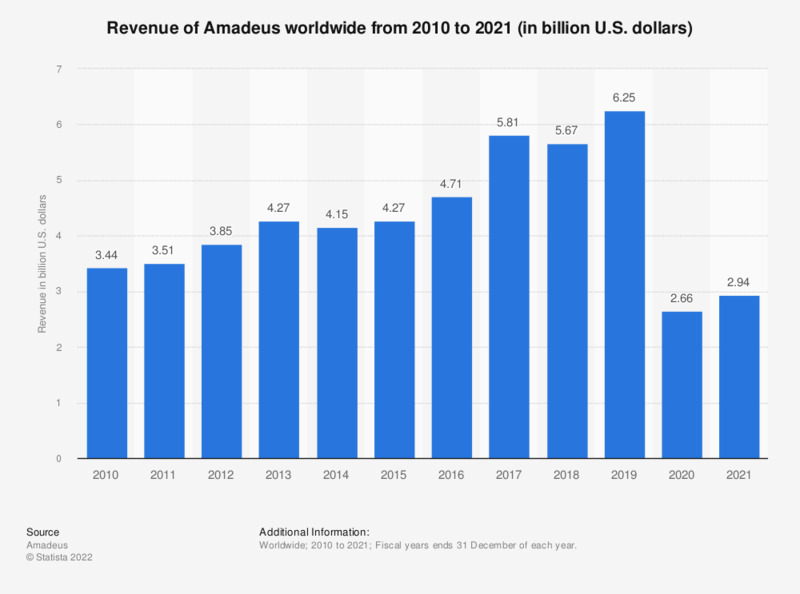 This statistic shows the annual worldwide revenue of the multinational IT and global distribution system provider Amadeus from 2010 to 2017. In 2017, Amadeus generated approximately 5.81 billion U.S. dollars (4.85 billion euros) in revenue, up from 4.71 billion U.S. dollars (4.47 billion euros) the previous year. Amadeus is an IT provider focused on the travel and tourism market. The company has two main business lines; global distribution systems (GDS) and IT solutions. Global distribution systems are used by both traditional and online travel agents as a search and reservation platform between themselves and travel providers. The company’s IT solutions department provides travel companies with software systems which manage internal processes such as inventory management and departure control. This line deals primarily with airline companies through its Altéa system. Amadeus was founded in 1987 in Madrid, Spain. European airlines Air France, Iberia, Lufthansa and Scandinavian Airline, created Amadeus Marketing SA to provide a neutral global distribution system for the European market. For the past few years, Amadeus made annual revenues of around four billion U.S. dollars which increased from around 3.4 billion U.S. dollars in 2010. The largest share of the company’s revenue comes from the GDS platform which made almost one quarter of the worldwide revenue in 2016. The number of reservations reservations made on the distribution platform has grown annually since 2010, reaching 566 million bookings in 2015, and dropping slightly to 534.9 in 2016. The success of the company’s global distribution platform has allowed Amadeus to become one of the largest distribution companies in the world, holding a market share of 70 percent of the global distributions market in 2016.
fiscal years ends 31 December of each year. Figures were converted each year on 31 December from Euros to U.S. dollars using the following exchange rates: 2010: 1 Euro = 1.32515 USD; 2011: 1 Euro = 1.29485 USD; 2012: 1 Euro = 1.32148 USD; 2013: 1 Euro = 1.3766 USD; 2014: 1 Euro = 1.21548 USD; 2015: 1 Euro = 1.09254 USD; 2016: 1 Euro = 1.05356 USD; 2017: 1 Euro = 1.19786 USD.